Bill Steinkraus at the Fairfield County Sports Commission Hall of Fame Dinner on October 17, 2016 at the Greenwich Hyatt. WESTPORT — Bill Steinkraus grew up in Westport and went on to win the country’s first Olympic gold medal in any equestrian discipline. On Nov. 29, in his home in Darien’s Noroton neighborhood, Steinkraus died at the age of 92. In addition to his skills as a record-breaking horse-show rider, Steinkraus, a Yale University graduate, was a gifted violinist and expert on old books and antique furniture. 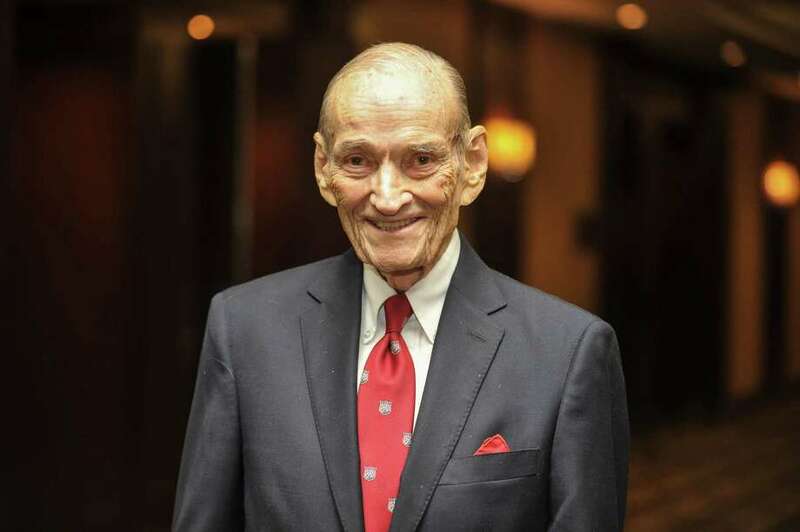 Born on Oct. 12, 1925, in Cleveland, Steinkraus grew up in Westport and postponed his time at Yale to serve in the Army during World War II, before returning to complete his studies and graduate. Steinkraus married Helen Ziegler, who died in 2012, in 1960. The couple lived on a large Noroton estate with their three sons until the estate sold for $175 million in 2016. After retiring from competition, Steinkraus worked as a television commentator and then judge for the Olympics. He was inducted into the Lexington, Ky.,-based Show Jumping Hall of Fame in 1987. Horse-rider Hugh Wiley described Steinkraus as a dynamic character. “He would think through a riding problem and always come up with an intelligent answer. After riding, he usually played his fiddle, read The Wall Street Journal or went to the opera,” Wiley said. Steinkraus is survived by his three sons, Eric, Philip, and Edward. His sister, Ruth Steinkraus Cohen, whose namesake is the popular bridge in Westport, died in 2002.